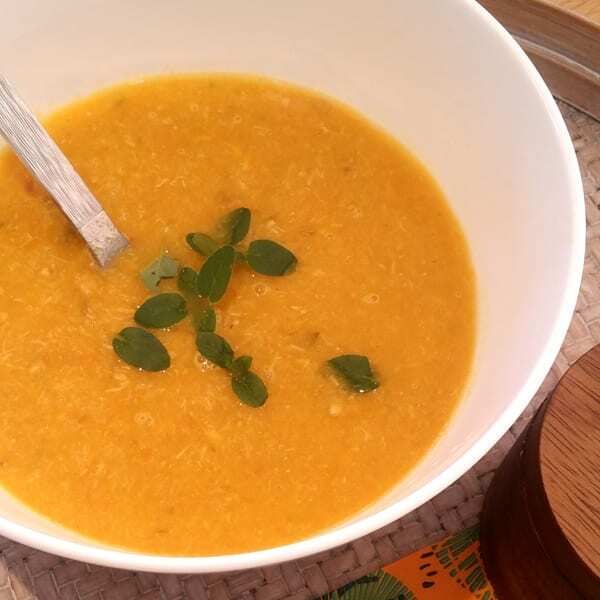 Why not combine our two favourite winter soups to create one delicious soup. Inspired by trying to please everyone at meal times I did just that. This recipe uses a whole chicken and creates a large batch of soup to freeze. Halve the recipe if you only want to feed 4-5 people. A whole chicken takes 3 hours to cook so start early. Alternately you can use just the breast or thigh and add water to desired consistency. Place the whole chicken in a large pot on the stove, cover with water, add a pinch of salt and a tbsp of apple cider vinegar and cook on low for 3 hours. Skim off any foam or scum from the top. Turn off the heat and carefully take the chicken out of the pot placing it in a deep dish until cool enough to pull all the meat off the breast and bones. Discard the carcass and add the meat back into the stock, chopping the larger pieces. Heat some oil or ghee in a pan, add the onion and fry in a pan on the stove, add the garlic and celery, frying until the onions and celery have softened, then transfer to the chicken pot. Chop the carrots and pumpkin and add to the pot. Add salt to taste or some Vogel Herbamare. Turning off the heat use a stick blender to blend all the veg and chicken to a desired texture. Enjoy! the warming and comforting soup. Recipe provided by Tory von Bergen.